The Minister of Mining and Metallurgy, Cesar Navarro, warned yesterday to confiscate the production, machinery and initiate a criminal process against the mining cooperatives that are operating illegally in the foothills of Illimani. “There are no documents proving the ownership of any private actor and in the light of these facts we will return to the inspection. If there is, we will take legal action, because this has to do with illegal exploitation and penal sanctions exist for those who are doing that illegaly. We will seize production, even equipment, machinery and will initiate a criminal process,” he announced. According to the authority, it was instructed to carry out a new verification to this snowy La Paz mountain and will act drastically against those responsible for the illegal exploitation. “We have already instructed and are delegating commissions to different places and also to the Illimani so that we can verify these acts, because based on the first complaints we have acted and will continue with the actions,” he said. 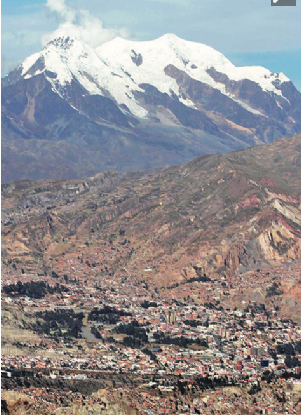 From the Departmental Federation of Mineral Cooperatives of La Paz, it was announced that, together with representatives of the Ministry of Mining and the Secretary of Mining of the Governorate of La Paz, an inspection will be made to the Illimani snow-capping mountain to verify if there is actually exploitation of minerals. This same one was denied by Navarro, who at that time, affirmed that in the place there was no mining operation. On February 26, the researcher of the Documentation and Information Center (CEDIB) Georgina Jiménez reported an involvement of 3,200 hectares of Illimani by the concessions of Comabol, a subsidiary of a Chinese company. Chinese capitalism is by far the most damaging to the environment, not only in their country but now in ours. This inept government has been extremely passive with the mining cooperatives as they endorsed them and led the coca grower caudillo to seize power.